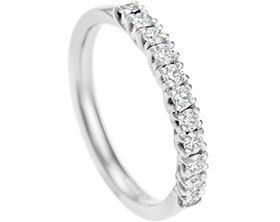 Inspired by a Mobius twist, this eternity ring has been handmade from Fairtrade 9 carat white gold and appears to have a continuous surface as a symbol of eternity. The central section has been pave set with seven 1.5mm round brilliant cut G-H VS 1-2 diamonds which have a total weight of 0.07ct. Intricate detailing continues in the form of engraved circles which continues around the edges of the band to emphasize the nature of the twisting form.